Best moment in the very ho-hum Silver Linings Playbook (a film fatally scuppered by having Robert de Niro play the father, so the whole thing just reminds you of Meet The Whatevers, but with a less likeable male lead). Jennifer Lawrence is great – the Juliette Lewis du nos jours, but the film less than the sum of its parts. Always Alright, however, is a keeper. Great lyrics, great vocal, a driving Stax-like beat topped with a bendy guitar riff, and I think that it’s still a free download at the Shakes site. Don’t you wish that you could play guitar like Bill Frisell? I know I do, every time I see him. There’s just something so human about his playing. I always think of him halfway along a scale from Joe Pass to Derek Bailey. Here he is, on a small platform, could be an arts centre. There’s the door to the toilets just behind him. The crowd sounds small, maybe fifty people. Cars go by outside on rainy streets. He plays the song, taking his time, taking the melody through a series of thoughtful stages. There’s always a little Reggie Young in his playing, rooting him in the Southern musics – here there’s a little Wayne Moss or Joe South, too, whichever of the two Blond On Blonde guitarists it was that invented the lovely filagree’d guitar figure that breaks the verses of the Nashville original of Just Like A Woman. …or, two hours in the company of some great folks from Nashville, promoting the Opry and the Country Music Hall Of Fame (one of my most favourite museums). Steve and I learn that there are few country songs about – or references to – cats (unless you count Nashville Cats and Kitty Wells, of course), that the glorious Don’t It Make My Brown Eyes Blue was inspired by songwriter Richard Leigh’s dog, and that Vince Gill is officially the nicest man in Nashville, as well as a killer musician and singer. Alexis Petridis on Steve Reich, The Guardian: “Well, I take the Chuck Berry approach,” he smiles. “Any old way you use it. In other words, music has to have legs. You could walk into a coffee shop and hear the Fifth Brandenburg Concerto. Well, it’s perfect for just sitting down and having your coffee and making the atmosphere more pleasant. But you could take that same music home and play it on your headphones and take out your score and say: ‘My God, this is the most unbelievable counterpoint I’ve ever seen in my life.’ Anywhere you put it, any way you orchestrate it –Wendy Carlos, Glenn Gould, you name it – if the notes are right, the rhythms are right, it works.’ After completing his studies in composition at Julliard in his native New York and then at California’s Mills College, Reich famously declined to continue in academia, preferring to support himself via a series of blue-collar jobs: at one point, he and Philip Glass started their own furniture removal business, which these days sounds less like something that might actually have happened than the basis of a particularly weird Vic Reeves sketch. An interesting-looking exhibition about to open around the corner at Lisson Grove. Pedro Reyes. 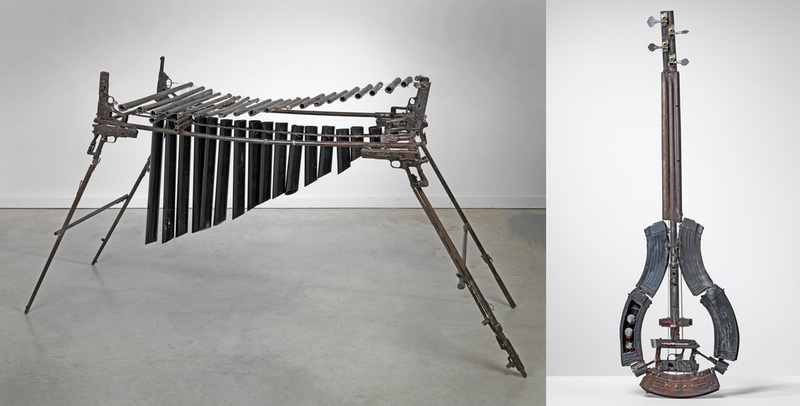 Musical instruments made from illegal weaponry.